Not good but not bad either This film could never be confused with the big-budget version that’s currently doing the rounds in cinemas but for a cheap mock-buster, it’s not all bad. 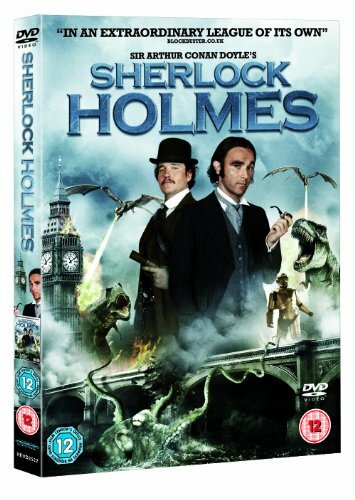 I wouldn’t call this a good film but I found it to be charming in an amateurish way.The production values and dialogue are quite clearly amateurish and there isn’t much in the way of dramatic acting – the actor playing Holmes is partically un-dramatic and speaks too quietly for a leading role – but again both Holmes and Watson are charming in their own way and have a nice and playful chemistry together. Gareth David-Lloyd makes a sweet but quiet Watson who’s a bit bumbling as times (surprise surprise, though he gets to help save the day in small ways) and Dominic Keating isn’t used all that much until the final 30 minutes of the film but he gives the most professional performance of all the actors involved.The story wasn’t too bad if you don’t think about it too much – the bad guy (partly out of revenge) wants to use mechannical monsters to wreek havoc on London – but it is over-the-top at times and I wouldn’y buy this film for the story alone.So overall, I wouldn’t advise people to buy this film if they’re looking for a professional movie to watch with friends or family but if you’re in the mood to watch something silly that involves Sherlock Holmes, mechanical monsters and a cheap but charming 19th century backdrop (and you don’t mind films that have an amateur feel to them) give this a go.For a cheap film, I’d give this 7 out of 10. For a film in general, I’d give it 3 out of 10. A Study in Maroon(s) So you’ve looked at the cover and thought – ” Hey, Ianto from Torchwood is playing Dr Watson and that blok who used to be in Desmonds and Star Trek:Enterprise is in it, and since he’s English and looks a bit Robert Downey Jr there, presumably he’s Holmes. This might be worth a look after all.”Only, he’s not. No, somehow the idea of having one of only two recognisable actors play ” The Great Detective” was too obvious for the makers of this movie and they went for complete unknown Ben Syder as Holmes. This is problematic for two reasons – one, he’s the shortest actor of the leading cast which gives us, for the first time ever, the bizarre sight of a Dr Watson a foot-and-a-half taller than Holmes and two, he can’t act.No, really – that’s not a cheap shot. The man cannot act. Indeed at times he can barely say his lines. Syder’s delivery would be all wrong if he had a delivery but he generally sounds weak and unconvincing, and occasionally looks as if half way through a scene he’s lost all confidence in himself and dries. This would appear to be his only credit according to the IMDB – launching out as one of the most beloved and iconic characters in English literature and world film is either an act of amazing chutzpah or foolish indulgence. It’s like watching your little brother doing his Charlie Chan impersonation.He barely manages to stand properly – lining-up opposite his fellow players is beyond him, which is problematic since it allows Gareth David-Lloyd, who obviously does know some stagecraft, to manoeuvre his “partner” in such a way that Gareth gets the best framing and Syder shows us the back of his neck. It becomes quite hilarious to watch. Imagine if during the making of the “comedy” Hound of the Baskervilles Peter Cook had lurched on set one day and announced that henceforth Dudley would be playing Holmes – that’s how this comes over.David-Lloyd, on the other hand, demands full credit – he’s in there, plugging away like a trooper and reading lines with the conviction that only three years playing opposite John Barrowman can give one. This is his chance at a leading role, and he seizes it and runs with it, bringing us a Watson who deserves to be in a much better movie, and giving Jude Law a run for his money. Dominic Monaghan, who surely can’t have cost that much to hire, clanks about in an iron suit ( another Downey Jr in-joke I presume ) that’s obviously made out of cardboard – and precious, expensive cardboard given how gingerly he moves in it ( unless it’s pinching him in the un-mentionables ) – reading his lines with relish. He’s good, but all that makes the viewer do is wonder why he isn’t Sherlock……sorry, Robert. Yes, that’s right. So ridiculous is this movie that it attempts to rewrite canon madly, giving us an evil Holmes brother we’ve never heard of before ( Guess who plays him ? Go on, guess…I bet you can ! ), and a new first name for the Great Detective. We have a lengthy scene where our pals can see a ship-wreck underwater from the top of some cliffs and Watson – er…climbs down for a better look. Another where they are stalked by a dinosaur in a park, which no-one notices, and a Buckingham Palace that is located in – well, it looks to be the same park, actually.Add in a giant octopus that pulls entire steam-ships to their doom but can be hung in the loft to dry, a veloci-raptor that stalks the streets of London, unseen no less, killing doxies ( take that, Alan Moore ! As of now you only came up with the SECOND- daftest suggestion for the Ripper’s true identity… ), one that kills off another character because he knows too much ( hah hah – this is one clever dinosaur, I tells ya !). There’s a clockwork assassin because, well, why not ? – a mechanical dragon and Lestrade as the cleverest detective in London. That last is, of course, the least believable thing in the movie.In short, it’s what Ed Wood would have written if he had been given a pile of raw footage, a half-dozen actors and two days worth of shooting time. ” Make a movie with the words ” Sherlock ” and ” Holmes ” in the title, but don’t put the two words together in the script in case he’s not public domain. Keep it cheap.”. It’s…entertaining. -ish.